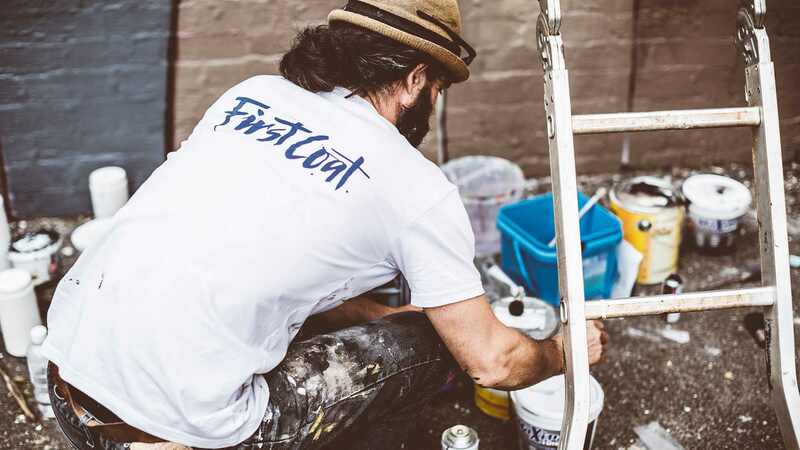 40/40 Creative was invited to help film the official video for Toowoomba's first street art festival, First Coat. The 3 day festival consisted of 15+ large scale murals being painted throughout the weekend from 27+ amazing artists both national and international including EWOK, MR WANY, SOFLES, TREAS, QUENCH, FINTAN MAGEE, SHIDA, REALS, MEKS, TUES, YESMA, WUBIK, TWOLAKS, THE GRID, JOHN KAYE and plenty more. The event was a major success for Toowoomba's Regional Council, GraffitiStop, Kontraband Studios and Toowoomba Youth Service. We stayed quite busy filming and socialising at all the different wall locations across the CBD and in between those, the opening launch party, the StupidKrap exhibition and also the Analogue Digital Artist Talks. All in all, it was a jam packed, fun and creative weekend. Special shout-out to the girls over at theGRID for the hospitality and accomodation! After trekking the city, partying with new and old friends, the community seemed to be enjoying every aspect of all the amazing art work and events popping up over the city. Here are some photos captured during the process of the many walls and artists that was all happening during this amazing event. There was far too much fun travelling around and meeting old and new friends whilst the community of Toowoomba overlooked all the awesome art popping up around the town.